Science is simply too important in a modern democracy to allow it to be misunderstood. MMR vaccinations, NHS funded homeopathy, climate change, are just a few recent reasons why its important that everyone can trust the way science works. Not everyone needs to understand the details of the science, but they should understand how it draws its conclusions. And that is what this blog post is about. To discuss the broader picture of how science works by way of the hot topics of the day can be difficult because they are entangled with emotional content, political opinion and/or economic consequences. Flat Earth theory is a great place to explore how science finds out about the world, because it doesn’t have such baggage. This frees us to focus on how science makes sense of the nature of things, without worrying about all the other stuff. To be clear, this post isn’t for Flat Earth proponents — they will never change their mind as they are not really truth seekers. This post is aimed at a wider audience of inquisitive people who want to see how a scientist approaches this topic. So, the question this blog essentially seeks to answer is, “How can I determine if the Earth is flat, or is a globe?” The twist is that I will play by the Flat Earther constraints — using only observations that you can experience first hand. It turns out this is a more interesting challenge than I had anticipated when I started…. Despite what the Flat Earther’s would have you believe, science does not work purely on things that are “measurable, observable, practical, testable, scalable repeatable, by anyone” [my emphasis]. Yes, these are important for understanding the world, but you also have to have an explanatory model of how things work. The sequence is as follows: make some observations; describe a model compatible with these observations that explains what you’ve just observed; make some predictions based on that model; then make some new observations to see if your predictions were correct. If not, refine your model based on new observations. If so, then feel confident that your model is a good one, until either (a) new observations contradict it, or (b) a better model comes along that also explains all the observations, but in a simpler way. So, how about we give the Flat Earthers the benefit of the doubt, and start from scratch. Let’s assume, for the purposes of this blog post, that any possible model of the universe is equally likely and see if we can narrow that down to only one of those models. Note that this is very different to the methodology the Flat Earthers employ. Most of them simply try to undermine evidence put forward for a Globe Model, rather than provide evidence for a flat Earth. Likewise, convincing some unsuspecting member of the public that they don’t understand why we know the world is a Globe is not the same as providing evidence that the world is flat. The Flat Earthers like to focus on what they can experience themselves, first hand. And so in this post I am taking up this challenge and aiming to focus only on evidence based purely on what you could experience for yourself. It might sometimes require some travel, or pieces of kit that you might not have easily to hand — but the principle is that you could do it for yourself, and measure it first hand, were you to get access to such equipment. In many examples, I will use my own first hand experience as evidence. We can’t use photographs taken by astronauts or spacecraft, as they can be faked (although I will mention photos in passing later in the post). Flat Earth or a Globe are not the only models you can formulate to explain various observed phenomena. The past three hundred years have seen various models proposed, including a Hollow Earth model (a spherical Earth but hollow, with people living on the inner wall), the Square World (a bit like in inverted soup bowl), conic worlds, and even Teed’s Cellular Cosmogony, where the entire universe in enclosed inside a spherical world, with the land we inhabit being on the internal concave surface. But let’s keep things simple and just stick to the two common ones, and see how we get on. So for the purposes of this post, my challenge is to take on the Flat Earthers on their terms, and see what happens. I am going to apply the scientific method to some of the things we can experience for ourselves, and try to determine which explanatory model performs “best”: the Flat Earth model, or the Globe Earth model. By “best”, we mean that (a) it must be fully compatible with our observations, and (b) it should be parsimonious, meaning that essentially it should be the “simplest” explanation. This second point is a key aspect of science — if two models fit the observations, but one requires fewer variables, or parameters, to make it work, then we choose the simpler model over the more complex one. The Flat Earth model states that the surface of the Earth is a disc, of unknown horizontal or vertical dimensions, and with a large “ice wall” around the edge that stops humans from going beyond the limits of the disc. The Globe Model states that the Earth is roughly spherical in shape, and the surface of the Earth is the continuous surface of the sphere. The sphere rotates on an axis through the poles, and it orbits the Sun. Let’s look at the evidence…. We can all observe the path of the Sun. It rises in the East, sets in the West. From our individual perspective it is easy to imagine a static Earth and a mobile sun. But that doesn’t help us here, as in both a Flat Earth and Globe model the Sun would appear the same to us. A few hundred years ago, it was easy to have a Flat Earth model and explain where the sun went after sunset — it just went below the disk of the Earth. But modern Flat Earthers have a problem, because many of us travel to different time zones, and each of us can call a relative or friend in a different time zone and ask them where the sun is. At any given time, the Sun is shining somewhere on Earth. For a Globe Earth, that is simple to explain (the Sun is always illuminating one half of the globe). But for a Flat Earth you need to introduce a Sun that never sets — instead, it is a sun that shines in a narrow direction, illuminating only part of the Earth at any one time, a bit like a giant lamp. Even ignoring the fact this makes the explanation very elaborate (why does it shine in only one direction? What makes it rotate? To make the seasons, how does it increase its rotational diameter?) it also doesn’t explain the Sun setting (or rising) over the ocean, as my own picture shows opposite. The Flat Earther explanation for the Sun “setting” is based on the principle of convergence in linear perspective. That is, when parallel lines recede into the distance they appear to get closer together, or converge, and the Flat Earther explanation is that the Sun and the horizon are just converging as the Sun travels further away. But if it was convergence, the Sun would get diminishingly small as it gets closer to the horizon, and it would never go behind the horizon. 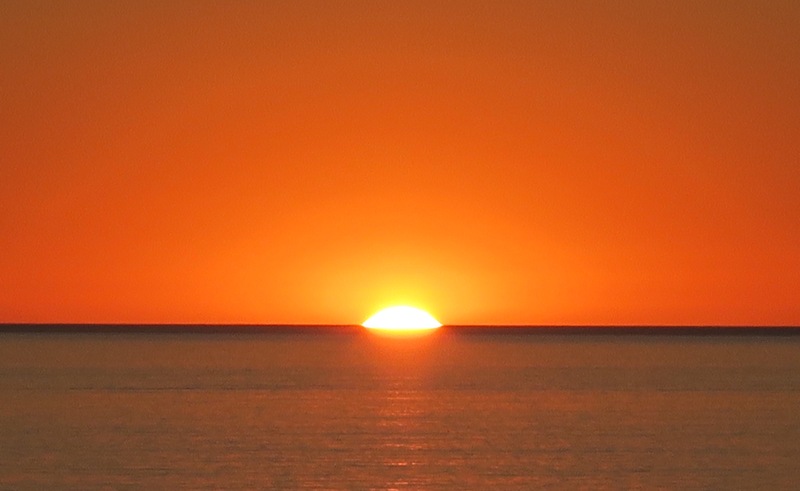 Rather, this picture shows a normal sized Sun half obscured by the horizon. So, is it being obscured by the “edge” of a Flat Earth (and therefore it would become dark everywhere, which we know is not true) or is it the impact of a curved Earth and the Sun is merely disappearing over the curve? My own photograph showing the sun setting, and being partially obscured by the horizon. In this Flat Earth models the Sun also needs to be relatively close (some thousands of km). In some Flat Earth videos, they will show you the rays of the Sun coming through the clouds and use this as justification for a nearby Sun. Interestingly, what they are seeing in this instance is the result of linear perspective — the Sun’s rays are parallel, but look like they are converging due to distance they have travelled. If the Sun’s rays are parallel (not converging on a nearby Sun) then surely they will converge into the distance in the opposite direction of the Sun also, not just the direction towards the Sun. In fact, this is exactly the case, as can be seen in what are called anticrepuscular rays (https://commons.wikimedia.org/wiki/File:Anticrepuscular_rays_20050918_in_Ye_Liou.jpg). Observing that the world seems flat is not a feature in this discussion, since both models would predict that on the scale of human activity, the Earth will appear flat. Even at the height of a commercial jet airliner, the horizon would only appear less than 4 degrees lower than the horizon at see level — too small to notice by eye. What is interesting about flatness discussions is that Flat Earthers will cite you the Bedford Level experiment. First executed in 1838 these were a series of observations carried out along a perfectly straight six-mile (9.7 km) stretch of the Old Bedford River on the Bedford Level, in England. They were aimed at measuring the curvature of the Earth. Following an experiment where Samuel Birley Rowbotham didn’t see a target on a boat mast drop below the line of sight over the 6 mile stretch, he claimed he had proven the Earth to be flat. However, in 1870, after adjusting Rowbotham’s method to minimise the effects of atmospheric refraction, Alfred Russel Wallace found a curvature consistent with a spherical Earth. That the Bedford Level Experiment was subsequently discredited, and repeated versions under more controlled conditions confirmed the curvature, is never mentioned by Flat Earthers. One of the things to watch out for in pseudo science is people selecting only the evidence that supports their case, conveniently ignoring the results of others. Citing 19th Century engineers or experimenters that suggest a Flat Earth, but ignoring simple observations you can make today, yourself, seems to be a common strategy of Flat Earthers. So if the Earth is a globe, how come all the water doesn’t run off? That is a good question. It also helps to draw attention to the fact that science is not about “common sense” because it deals with extremes beyond your experience, so we use evidence and rational thinking instead of common sense. A Globe model requires gravity, the force of attraction that masses exert on each other. A Flat Earth model definitely doesn’t want gravity to be a real force, because it introduces some very specific contradictions (see next section). Gravity is certainly pretty weird and it is not yet fully understood, but there is more than enough evidence for a force of attraction based on mass (discussed below). The Flat Earthers make the case that gravity is not a real force. Yes, we experience a force pushing us all to the Earth, but the Flat Earth explanation is usually one of two alternatives. The first simply states that there is a general principle that “anything denser than air floats up and anything heavier than air falls”. This is a description, not an explanation. It doesn’t explain what it is that is actually pulling things down or pushing things up. (Gravity can explain buoyancy — the less dense object is pulled down with less force than the surrounding air, so that the air moves in below it and exerts a pressure force upwards.) It also has difficulty explaining why a bowling ball and some feathers fall at the same rate when dropped in a vacuum (see video). So, this explanation doesn’t answer the question of what is pulling things to Earth. The second explanation is that we experience an apparent acceleration of 9.8m/s2 downwards, because the Flat Earth is accelerating upwards at 9.8m/s2. This second one is a valid physical explanation. An upward accelerating Earth would indeed generate the same sense as gravity. Likewise, were we living on the insider of a large cylindrical World that was rotating, we would also experience a sense of gravity (as illustrated in 2001:A Space Odyssey) . If we ignore the many practical questions left unanswered (e.g. what is propelling the Earth upwards? Will we ever reach a maximum?) is there any experiments we could do to test this model verses the model whereby we have gravity as a force exerted by, and on, the mass of an object. One way to do this would be to show that acceleration due to “gravity” is not constant everywhere. In an accelerating Flat Earth, the apparent gravitational acceleration would be uniform across the entire surface (since everything would be undergoing the same acceleration). But on Earth we can show that gravitational acceleration is non-uniform. By using gravimeters — somewhat more accurate accelerometers than those in smart phones — we can map the variation in gravitation acceleration over small areas. As a young undergraduate I made a range of measurements with a gravimeter along Dalkeith Road in Edinburgh. I can confirm with first-hand experience that acceleration on Earth is not uniform. You’re smartphone is not accurate enough to pick this up, but if you need convinced, come along to a field class for our geophysics students sometime. A non-uniform acceleration is not compatible with a Flat Earth, but it doesn’t quite prove gravity as a force of attraction between masses. So let me call on an alternative way to demonstrate the existence of gravity as an attractive force between masses. Some Flat Earther’s claim that this has never been done before without recourse to astronomical observations, but in fact that is not true, and there is even an experiment you can do yourselves. I had originally thought to describe here the Cavendish experiment of 1798 that measured the gravitational pull of large masses in the laboratory, using a torsion balance that suspended large lead spheres and then measured the gravitational pull these had on smaller spheres. However, many Flat Earther’s claim this was a hoax (as they are prone to do with anything that contradicts their model), and has never been repeated, but there are many examples of repeated versions, and there are even countless videos on Youtube showing successful versions. But there is also a large number of videos showing unsuccessful versions, and I am happy to admit that its a tricky experiment to repeat without proper equipment. So, instead, I’ll come closer to home with an experiment that took place in a location less than two hours drive from where I live. The Schiehallion Experiment is the most famous of the 18th century experiments looking at measuring Newton’s gravitational constant. In 1774 Nevil Maskelyne, the then Astronomer Royal in the UK, measured the deviation of a plumb bob either side of Schiehallion, a Scottish mountain chosen for its size, symmetry and comparative isolation from other mountains. The reference frame was the position of the stars, which even the Flat Earthers are happy to accept as a stable form of reference. Not surprisingly, there are far fewer counter arguments against this experiment than there is against Cavendish’s. (Note that an easier version of the experiment uses pendulums instead of plumb bobs, and you can replicate it yourself using the kit described here: http://www.countingthoughts.com/ct/index.php?page=wtw ). While on this subject, let me answer another common question — if gravity is so powerful it can hold all that water to Earth, why doesn’t it squish us flat? That answer is that gravity is not an especially strong force, but it is persistent and relentless. I can go to a beach and scoop up some water with my hands. It is only time and motivation that limits my ability to lift all of the oceans up, scoop by scoop. It is not the pull of gravity that would stop me. But each scoop of water is pulled to the Earth in proportion to its mass, and so water, and people, are constantly pulled towards Earth at an acceleration of 9.8m/s2 . So it would appear that gravity is a force, and that it is due to the mass of objects. The pull of objects to the ground cannot be due to an upward accelerating Earth because the acceleration is different in different locations. The final note on gravity is that there are two main reason’s why a Flat Earth model has to assume that gravity doesn’t exist. The first is as a above — it offers a reason why objects still fall towards Earth, even “on the bottom” of a globe. The second is that on a Flat Earth, the gravitational pull would be asymmetric — at the edge of the Flat Earth disc, gravity would pull you to Earth obliquely, not straight down, because near the edge, most of the mass of the Earth would be to one side of you. The only recourse a Flat Earth model has here is to introduce the idea that the Flat Earth disc is infinitely wide, which then begs the question, where is the Sun going in my sunset picture above? A small digression. There are a number of websites and smartphone apps that will inform you of the tracks of artificial satellites across the night sky, some of which you can even see with the naked eye. Without gravity pulling them into orbit around a Globe Earth, the path of these satellites is very difficult to explain. Let us now consider the apparent motion of the Earth, and see if that can offer us any further differentiator between the two models in question. The first question we might ask is whether the Earth is moving at all. We can certainly have a Globe Earth in a geocentric (Earth at the centre) solar system whereby the Earth is static and everything else rotates around us. And this would also be the case with a geocentric, stationary, Flat Earth model. So the daily motion of the Sun and stars and Moon are not helpful, other than to specify that any movement of the Earth or the Heavens is on a 24 hour period. So, is there any experiments we can do on Earth to determine if the Earth is moving, rather than the stars? One such experiment is called Foucault’s Pendulum. The simplest way to understand this experiment is to consider being at the North Pole (Flat or Globe) and swinging a very large pendulum (the size is merely to account for other variations such as air movements). At the poles, over the period of 24 hours, the plane of the swing on the pendulum rotates a full circle (360degs). What I mean by that is that if you were to pull up a chair and watch it for for a whole day and night, the pendulum might start swinging back and forth towards you, but after 6 hours it would be swinging to your left and right, then after 12 hours, back swinging to and fro, then after 18 hours left-right, then at 24 hours, back to forward-back. There are Foucault’s Pendulums all around the world (https://en.wikipedia.org/wiki/List_of_Foucault_pendulums). The most recent one I saw was at the Geocenter, Faculty of Science, University of Copenhagen which has a length of 25 m and weighs 145 kg. When in the high latitudes, we can observer the rotating motion of the stars in the night sky. They appear to rotate around the Pole Star (Polaris). But if you go to the southern hemisphere, there are constellations towards the South that you can’t see from the Norther hemisphere. Not only have they been obscured the land, but they rotate around a Southern point of rotation. There is no Flat Earth model that can explain this observation. It is best explained by a Globe Model, whereby both the obscuration of the constellations, and that apparent rotation around both a Northern and Southern axis can be explained. This last one is a little more elaborate, but it is still an experiment you could do for yourselves. Get a barometer (I have a one on my wall that I can lend you) and log the air pressure and wind direction over a number of weeks. At high latitudes, you will find that as you move from high to low pressure, the wind direction changes from Southerly to Northerly direction. Over time, you can build up a picture of cyclones (low pressure systems) and anticylones (high pressure systems) that are typical of mid-latitude weather patterns. Areas of high pressure rotate clockwise. Areas of low pressure rotate anticlockwise. The reason for this is that the Earth is rotating. The apparent force that turns the air is known as the Coriolis force, and is caused by the same angular momentum effect as when a spinning ice-skater brings her arms in to speed up the rate of spinning, or stretches them out to slow down. In itself, this effect could be the same whether the world is flat or spherical — a Flat Earth rotating anticlockwise would cause a similar pattern of rotating air masses. The tricky bit for the Flat Earth model is that as you move to the Equator, there are no longer any rotating air masses, and when you get into the mid-latitudes of the Southern hemisphere, the cyclones and anticyclones rotate in the opposite direction! A rotating Flat Earth disc cannot explain these observations. A globe model explains them very neatly. “Did you know there are no complete photographs of the whole Earth?” is one argument that you might hear from a Flat Earther. This is simply not true. Nobody (except Flat Earthers) would claim that the high resolution, full-disc images that are composites of low altitude, high-resolution satellite images is anything other than a composite. There is no other way to do that at high resolution (seeing details <1km) because you have to be close enough to the surface to see the detail. But there are a great many whole disc images with lower detail from a range of sources: the Apollo mission photographs (from 1968 onwards), the many photographs from interplanetary craft that have taken a “selfie” on the way out (see here for a nice collection of shots of the Earth and moon together, and my favourite one opposite take by Voyager in 1977), not to mention the full disc images taken every 15 minutes by the network of 5 geostationary meteorological satellites in orbit since the 1970s. The globe Earth and the Moon as photographed by the Voyager spacecraft in 1977. 7. Summary I have learned two interesting things in researching and writing this blog. The first is that the Flat Earth model is dead as a theory, because the evidence we can all collect with our own eyes cannot be explained by a Flat Earth model. A Globe Model explains it all, easily, simply and with elegance. I will admit that part of me is kind of disappointed that the Flat Earth model wasn’t more robust — there is something rather exciting, romantic even, about the idea that a few people might turn over our strongly held beliefs and demonstrate a new, clearer understanding of the natural world. “The most obvious points, the things we’re absolutely sure of, may turn out to be wrong,” as Carl Sagan once put it. And contrary to what many people might think, most physicist would just love to be able to prove that some standard theory turns out to be wrong — that’s what all our heroes did. But Flat Earth isn’t the one. The second is the realisation that it wasn’t Nasa that killed the Flat Earth model, it was friends and relatives. That is, the friends and relatives that most of us now have that travel to, or live in, different time zones, or in a different hemisphere. I can watch the sun set over the horizon, and watch it get dark, while simultaneously Skyping my cousin in Australia who is just watching the sun rise over the ocean. And when I visited her, I can watch with my own eyes, different constellations in the sky rotate around a southern axis. I don’t need Nasa to show me pictures to be convinced that a Globe Model is a better fit to my observations. So what will Flat Earthers will make of this post? Well, to be honest, I couldn’t care less. They will no doubt assign me a prominent role in the grand conspiracy, while continuing to do exactly what they accuse the conspirators of doing — spreading false information, being selective with the evidence, and failing to answer the difficult questions. It is the Flat Earthers you need to be wary of, as they are the biggest conspirators. Meanwhile, I will continue to promote the scientific method as the most trustworthy process to establish the truths of the natural world. There is other important point, which is that you have to be prepared to trust others to conduct some of the experiments. Not everyone has a Hubble Space Telescope or a Large Hadron Collider in their garage. But for this post, I am sticking to things you can do first hand. Excellent article. I posted it and ‘rightly’ got a complaint from someone that they ‘didn’t read it’ because you posted a link to the CONCLUSION at the top, that takes you to a SUMMARY at the bottom that is not actually a conclusion based on your findings. You are claiming it’s the scientific method, so you might want to put a conclusion of your findings, then a summary after that. Not arguing about the content otherwise. It’s excellent and well written, but this sticking point has caused all the flerfers to ignore it, and complain that you don’t know what the scientific method is since a scientific conclusion and a ‘summary’ of an article are different. Of course they are going to find a reason to ignore it, but don’t GIVE them a reason to do so. Keep up the writing, I loved it. Thanks for posting. Where did you post it? There is a conclusion. It’s not so unusual to have a conclusion within a section entitled “summary”. Sources I can find says that The Cavendish experiment was carried out 1797-1798, not 1779. An infinite plane will not cause any additional problems for the flat earth theory – The sun is observably only in zenith between the tropics of Cancer and Capricorn. Both the globe and flat earth theories account for that. FE by not letting the sun orbit further away from the north pole than at the tropic of Capricorn. There is a flat earth model, DET, which can explain southern constellations rotating in the opposite direction: it ha the northern hemisphere on the upper side and the southern on the underside of a flat disc with the equator as the edge. You probably don’t need to borrow a barometer to do the coriolis experiments, any resoanbly high-end smarthphone has a built-in barometer. How does DET deal with gravity?